We leave Voorschoten at 2 PM after a breathless crossing of the finish line in our usual race to who-knows-where with the professional and domestic check lists. Driving by Antwerp, Brussels, and breezing through Luxemburg, we are in France in the early evening. It feels different but I am not sure how much of that feeling is all in my head. We find a slightly shabby hotel La Stephania in a very shabby town of Hattange Le Grand. The room is spacious, with a sumptuous bathroom. We have to ask for towels. After checking in we head to the small family restaurant L’Entranct in the neighboring town of Volmerange le Mines we had passed earlier. A family of four are the only other guests. The woman who serves us rarely smiles while being friendly at the same time. Not found in America. I order a mysterious dish of pigs’ feet, which turns out to be the best tasting thing I have eaten in a long time. They must have cooked the pigs’ feet for a long time, until the flesh came off the bones, and then chopped them, the Polish style. But instead of making a jelly mold the cook formed a sort of croquette and grilled it. It really was a perfect dish for me. Philip of course, would not touch it. Few people would. The town seems dead. In the morning we buy pastry and lunch food (ham, baguette, yogurts, tomatoes). Before getting on the highway we follow the signs for Maginot Line. The site consists of two bunkers and a barb wired field that might once have been a minefield. We reflect on the history of the Second World War, the futility of this defense line, and France’s role in the war. We drive all morning on these high quality highways. We enjoy a little picnic with lunch at one of their nice rest stops. In the afternoon we arrive in Beaune, a small and beautiful city, one of many such magic places we would encounter in the days to come. It is teaming with people and flooded with sunshine. The main tourist attraction here is Hotel Dieu, a fifteen century hospital for the poor, established and run by nuns. It was a modern institution where poor were treated with dignity and afforded considerable privacy. The building is spectacular: deeply sloping roof is made of colored tiles which form mesmerizing patterns. This place has been a functioning hospital until the mid nineteen century, and one of the buildings is still used as an old age home. Our visit falls, luckily, between two waves of tourist groups. After Beuane we get onto back roads. We pass small town and villages, occasionally stop to look around and stretch our legs. The landscape is pastoral and very green: rolling hills, pastures with these albino-looking identical cows, occasional woods. The plan is to get deeply into the countryside and find a night accommodation in some country oberge. But while passing through a small city of Autun we just do not want to go any further. We have driven about 500 km today. A hotel that catches our attention, St.Louis, turns out to be a spectacular building with winding marble staircases, graceful archways, large verandas, and a long history. The place is deserted: no busboys, no concierge, and no guests. The proprietor, a cultivated old gentleman with aristocratic manner and looks tells us on several occasions that he will be here only until the end of October, at which point the ownership of the hotel will go to some large company. He clearly does not feel comfortable behind the registration desk. He is Swiss, with a home in London. The literature about the hotel makes things a bit more clear. Apparently he bought this place a year of two ago in order to create some sort of a spiritual center, and something did not work out. Next to our room is the so called Napoleon Room where Napoleon once stayed with Empress Josephine. The furniture is all original. After checking in we walk through the city until about 7:30, and then settle for dinner in a not particularly inviting small restaurant/bar. The view from the place is directly on the main town square and its neoclassical architecture. But the food does not inspire confidence. We have no choice in the matter as this is the only functioning restaurant we can find. At night this town goes to sleep. The food is not too good, especially Philip’s dish, which is some sort of conglomerate of animal innards, rolled up and grilled or fried. Not only is it uneatable but the smell of it is disgusting. We envy the couple next to us, who look like Swiss tourists, who can carry a long discussion with the waitress before ordering. The waitress looks young and tired by life, and definitely not interested in her work. Four drunks in the inner part of the restaurant, by the bar, make a horrendous noise, and we are relieved when they finally leave. The walk through town reveals its complete lack of nightlife. In a street café we encounter the familiar four drunks sitting at an outdoor café table filled with empty beer glasses and bottles. Amazing how much alcohol people can purr into their bodies. This is a romantic walk through the quiet streets of this town. When we return to the hotel, around 10 o’clock, we see the proprietor in the hotel restaurant, having dinner alone, in a completely deserted big and very formal hall. A striking sight. If I stayed here alone I would welcome an opportunity to have dinner with him and to hear his story. In the mornings we drive on back roads. It is a slow drive, at average speed of perhaps 70 km per hour. Rolling hills, winding roads, and pastoral, very green. We stop briefly at Luzy. At noon we get to the lively Moulins. We take refreshments at an outdoor café. The waitress vocally complaints that all we order is drinks and a piece of pastry, at this is lunch time. Rules are rules in this country when it comes to what you eat at what times. They must have food police somewhere out there, critically looking at our out-of-phase existence: breakfasts too late, lunches too late, dinners (I wish we could have them too early but they are not available). We stop in the fields to have picnic lunch. This is a lazy afternoon of a beautiful sunny day. We linger on the grass, by a tall hedge. No bugs, no people. Drive on. The landscape becomes flat and uninteresting. At some point we abandon the back roads through a monotonous landscape and get some speed on a highway. We pass Riom and Clermont-Ferrand and continue southwest in the general direction of Aurillac. At the end of the afternoon we get off the highway again, looking for the place where we shall spend the night. It is now a mountainous region, lush, full of rivers and chateaus perched on mountain tops, some in ruins, others quite functional. Today we drove about 250 km. After passing the small town of Massiac we notice a sign for a campsite. Shall we? It is such a lovely day, so we decide to give it a try. The campsite is deserted, the shower and bathroom facilities are closed for the season. But this is a lovely spot, along the river, under the trees, and so we stay. The tent gives us some difficulties, and the home we eventually erect is not entirely stable, with the main two poles tugging at each other at dangerous angles. Hopefully the wind, very strong throughout the day, will calm down. By now it is time to look for places to eat and drink. There is a village of Molompize only a half a kilometer from us down the road, we can see it from the entry to the campsite. In a little café (the only one they have) we have a beer and follow the proprietor’s instructions to look for a restaurant in Massiac. Massiac is a small town, similar to the others we passed. It has one rather prominent hotel, Post Hotel, with a large restaurant. This is where we have dinner. White table cloths and very serious old fashioned service does not entirely compensate for the inferior grilled salmon I receive. This is an odd sort of place: everybody is quite old, and there are far too many people for such a small town. These are clearly out of towners, staying in the hotel. But why do they come to this place? Philip hypothesizes that this must be some package deal between the railroads (a fast train passes through this area) and the hotel, tailed for senior citizens. A sort of little getaway into the country side, perhaps for some short walks. In any case, we enjoy the slow dinner and the display of life in these parts. The campsite is pitch dark, the stars are bright. In the darkness we become aware of an imposing ruin of a château on the top of a steep hill, only a few hundred meters from our camp, fantastically illuminated with floodlights. We take a walk to take a closer look. At the foot of the chateau’s hill we discover a tiny hamlet, not even a village, of houses. They are clustered around a small “town square”, a fountain surrounded by a ring of planted trees and a couple of inwardly facing benches. All illuminated. Really charming. For some time we roam the few streets of this hamlet, completely silent but alive inside houses. To me it looks like gentrification of an old tired French village. The stone hoses show signs of recent renovations, and the care taken of the newly paved streets indicates that capital has been flowing into this spot. Perhaps foreign capital, although car license plates do not show that. We slept well, despite the hard floor mats. We hope to camp again tonight, if it does not rain. Breakfast in the familiar café in Molompize: café grande and croissants. After breakfast we walk back to the campsite and pack up the tent. By now it is slightly drizzling. We go to explore the castle from last night, and the tiny village (its name is La Rioche), this time in the daytime. Once we are up at the castle, it is clear that we should have camped here last night. The ruins stand on a triangular flat wedge of land over two very deep river valleys (the rives must merge down there beyond the reach of our sight). The grass-covered grounds, bordered by a stone wall form a perfectly flat terrace with a view of the two valleys. It would have been so romantic to camp here last night. We have no idea who owns this property but we see signs of restoration work around the windows. There is an uphill road up from the chateau, marked as a trail, and so we take it. Over the next hour or so we climb up, first through the woods, and then open fields, without a living soul anywhere. Abundant blackberries turn the walk into a fiest. On the top of the mountain the road suddenly opens up into a stone village. Such a surprise! It seems that this entire country is dotted with villages small and large, hidden in the most unexpected places. A man is working in the field, his car parked in the road. We exchange greetings. We return to the car around noon. We drive in the southwestern direction, toward Aurillac. The first hour or two of driving takes us through the mountainous region. We stop for lunch in Murat, a picturesque town that has all the characteristics of a tourist trap. The shop windows look like those in Wellfleet. There are a few tourists here at this time of the year, attired like serious hikers. Despite the gloomy weather we are able to have lunch in an outdoor café. Our next stretch of driving continues through the back roads. I do not do well on these winding roads, so Philip must do all the driving today. The landscape turns into mild rolling hills. We pass many villages, all made of that local gray stone, all full of flowers. It rains, at times heavily. Nothing much happens until we reach our home for tonight: Rocamadour. It is a famous tourist destination owing to a chateau and a village below that are literally cut into a vertical rock overlooking a valley below. Across the valley, on a high ledge there is another village which serves the tourists who come to see the castle, appropriately named Rocamadour L’Hospitalet. We find a pleasant little hotel there, with a view from our room straight over the valley. The tourist season is pretty much over here. We have the village and its vistas all to ourselves. At dinner time the rain stops. Philip is tired after the difficult drive today. We venture only across the street for dinner, which, for me consists of a salad and a crepe. I wake up to the sound of a church bell, counting to eight. Astonishingly, outside our window the valley is completely filled with fog: a big blob of whipped cream fills it like a desert dish. The sky looks promising. Perhaps the rain clouds will disperse today. The fog quickly thins out and is replaced with another show: one after another, hot air balloons take of from the bottom of the valley and majestically travel over the rime of the valley, somewhere behind the trees. The balloons are multicolored, and the sight is really splendid. Today is the first day of Rosh Hashanah. I feel homesick. I am somewhat sluggish this morning, tired altogether of the late and excessive meals, day after day, with too much wine. I want to eat my own food and on my own schedule. Restaurant life is not for me, a discovery I make anew each time we travel. After breakfast we hike to the ancient site of Rocamadour. Between the narrow sides of the village walls there are the familiar accoutrements of a touristy place: leader and souvenir shops, cafes, women fashions, imitation antiques. Fortunately the tourist season is almost over. We meet primarily older people, some in bus-size large groups. It appears that many people come as pilgrims and tourists at the same time. It is an arresting site but Philip and I have seen such beauty before. At noon we are on the road again. We take increasingly narrower country roads. The sharp cliff landscape gives way to milder and more bucolic one. We pass the Dordogne River, and enter the Dordogne Region. We pass many castles, big and small. We drive through towns with masculine names such as Mayrac, Pinsac, Souillac, Carsac, le Faget, Sarlat, Beynac, Marnac, and note on the map others: Lansac, Presignac, Peyrillac, Rouffillac, and dozens more in a small geographic area. They all sound maddeningly similarly to my un-French ear. The villages in this area look differently than those we saw yesterday and the days before. They feel more Mediterranean. It takes us a moment to figure out the key difference: it is the stone used for building. The stone has a deep yellow color and, at least from the distance, the appearance of sandstone. The stone to which we have become accustomed over the days has been gray and hard looking, like granite. This one looks soft. Once we identify this feature our eyes open to other differences. For example, some houses (the newer ones) have stucco surfaces, also made in the same shade of yellow. There are also more terraces, which contributes to the Mediterranean feel. We arrive at our destination in Buolegue around 2:30 in the afternoon. It is slightly raining. Our hostess greets us in front of the house. This is a beautiful place! The house is made of the local yellow stone, and everything in it, inside and out, reproduces this yellow softness: cement between stones is yellow, the stone banisters are made of yellow sandstone, the kitchen and bathroom countertops are made of yellow marble. Our part of the house has an enormous terrace, which would fit perfectly in an Italian villa. The feeling is all Mediterranean: tiled floors and stucco walls inside, none of those large windows you find in the sun-starved Netherlands. The furnishings are simple, cozy, and in distinctly good taste. We have a spacious sitting/dinning/cooking room, a bedroom, and a bathroom. And a huge magnificent stone terrace with a view on the wooded valley below. The refrigerator is full, including a chilled bottle of wine. A marvelous loaf of fresh bread awaits us. After settling in and a quick bite we go to the local supermarket. The food is remarkably inexpensive here, compared to the Netherlands. Half or less than have the price of comparable items. The fruit and vegetables look good. 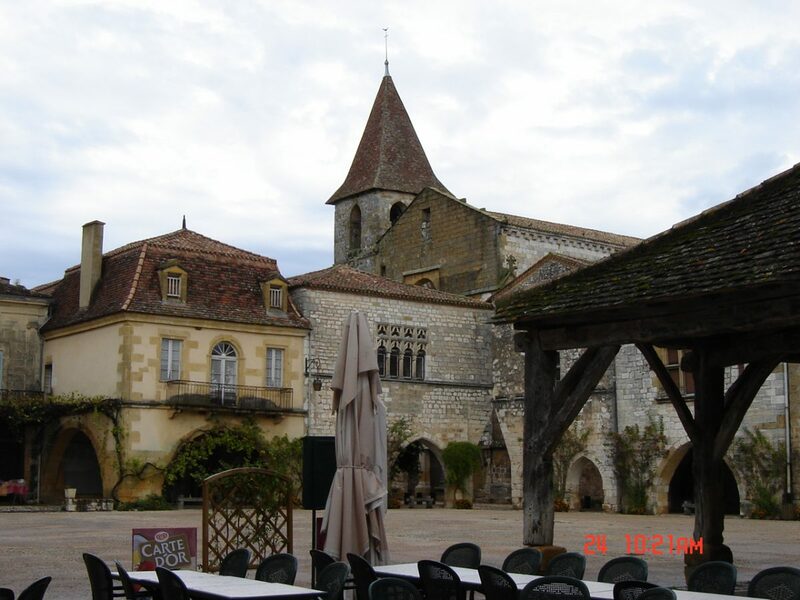 The man who serves the fish counter, and who is a transplant to this area of France, extols the wonders of Dordogne as the most harmonious and beautiful place to live in this country. Talks about the coexistence of the French, English, Dutch and other nationalities, about the mild climate, about the spaciousness. Philip translates some of it, but for the rest I ca figure out what he is talking about. It is amazing that French language, of which I know absolutely nothing, is so much more accessible to my ear and brain than Dutch language, which I studied a bit, and to which I have listened already for years. In French I can recognize words and guess the meaning of some of them more than in Dutch. We fill up the cart, fill the gas tank, and eagerly go home. I enjoy very much cooking a meal, while Philip peruses the maps of local guides. After dinner, in the dark, we take a walk along the road and discover other houses in the neighborhood. Beyond that, our ambitions regarding doing things are very modest for the next 24 hours. Rain. Disappointing, persistent rain. Not a passing shower but a determined state of the atmosphere. The weather channel is not encouraging. We read all morning. I do not mind, Philip takes the lack of sun harder. My thoughts run to the owners of this place, probably enjoying this gray, slow Sunday. They are about our age. Hendrik is a musician/cantor who came here a decade ago, bought this ruin and put a great deal of his own muscle power to rebuild it. Over the years he developed various business activities: conducts and records music, deals in the local stone, sells real estate. Leni has joined him, also from the Netherlands, three years ago, after the youngest of her three children has become independent of her. They both look bohemian, especially Hendrik who cultivates a hippie look with shoulder length hair and a beard, and soft unstructured clothes. She has a face that is not young and very pretty and free of stress. Philip is of course interested in their transition and their life in France. This house comes as close as anything he has ever seen to the idea of a “house in the country in France” he has been nurturing for years. By early afternoon signs of brightness appear in the sky. We take to the road to explore the local area. There is a village about 3 miles from here, the closest village to our house, which our hostess noted has two good restaurants and a small grocery shop. We walk around it, along with some French tourists. The only signs of life come from two restaurants which are filled to capacity with families enjoy their midday meal. This is what people do on Sundays, I guess, or at least on rainy Sundays: a long meal with family, friends and plenty of wine. The very idea of it gives me a headache. I cannot even bear Sunday brunches, much less spending ours around the table over a heavy meal with wine. For me, slow eating is only for evenings. During the day I must move and breathe at least some fresh air. One striking observation about this restaurant is its quietness. It is a small place, with tables tightly packed and completely filled, and yet, it is so quiet. A restaurant like that in New York or Boston would have a very high level of background noise. I suppose people come to enjoy their meals in the first instance, and the intense conversation is a secondary matter. Also, they just speak softly in public spaces, just as I was taught in Poland. I like this custom very much here. Our main touristy activity today is a visit to Montpasier, a small town about 12 km from our home. Driving there and back demonstrates the vastness of this area and the scarcity of development. The single-lane winding road takes us through woods and fields, and occasional hamlets, but for the most part we see few people, homes or cars. The villages are completely silent and almost completely devoid of people on the streets. Living here means living in silence and away from action. A car is a necessity. We must remember that as we contemplate what it would be like to own a house here. Montpasier is an amazing place. Ancient, early medieval, completely preserved. We each have seen such buildings before, of course, but probably never in this configuration: a perfect town square where each building is of different design, yet all fit together into a whole that takes us back in time instantly. The central town square has not changed in many centuries, close a thousand years. Although we skip the guidebook descriptions of if, we can tell that these structures date back to perhaps the twelfth century. And people live in these buildings! (probably not very comfortably, I dare say). Many buildings have multiarched galleries for commerce, similar to those of Sukiennice in Krakow, though on a much more modest scale. The corners of the market place must be famous through the tourist guide world; there must have been a requirement at the time of their construction that each corner creates an opening for entering the square. The buildings meet at these corners but each juncture has its own architectural solution on how to create an opening: one is half an arch, another is a triangular opening, and so on. We take coffee and share a piece of pastry in a café. Only tourists occupy other tables: French and some German speaking group of four (perhaps Swiss, judging by their perfect French). Then we stroll, visit a small exhibit of photographs telling a story of a famous son of Montpasier, an early twentieth century adventurer-entrepreneur-politician. People in this region must be suffer from chateau-envy. How else do we explain this passion for towers? People love their towers. Towers are all the rage here. Even houses that look quite new often have towers. These are usually one story higher than the main structure, have a steep pointy roof, and are square. Our hosts just finished this year adding a tower to their house. Hendrik just went to the Netherlands this morning to arrange for transporting his grand piano into his brand new tower. This will be his dream come true. I like these towers. The rest of the afternoon we spend at home, reading, cooking, listening to Bach’s oratorios recorded by our host, and watching a movie on DVD. Philip cooks two enormous artichokes for dinner, which are a modest success with me, but not an epiphany. By the end of the day the rain has ceased, and the sunset promises good weather tomorrow. I slept badly after watching the macabre “Leaving Las Vegas” movie last night. We get up to a brightening sky, after a night of rain. As every morning, a loaf of fresh bread awaits us in the wine cellar behind the bedroom. This is a really nice touch by our hosts. Philip spends an enormous amount of time looking for things. It can be irritating or hilarious to watch, depending on my mood. This morning I watch him look for the camera. In the process of searching he scatters other items he happens to be holding, with the effect that as soon as he finds one item he starts searching for the next. He must spend at least one hour a day just searching for misplaced items. I spend that hour maintaining my body: calisthenics face exercises, gum massage, and on and on. At around 11 we round up the hiking boots, pack a picnic lunch, and set off to explore this region on foot. For the next several hours we walk through meadows, pastures, a medieval village, several hamlets, a forest, fields still filled with corn and sunflowers, and other farmlands, guided by Philip’s 16 year old hiking maps, his compass, and his uncanny sense of direction. I am clueless when it comes to find my way or even recognizing the places I have walked before, and am enthusiastically agreeable with all Philip’s suggestions. We make several discoveries, such as, for example, that cows in this region are yellow, just like the building stones and some of the back roads. That every tree in the forest is a chestnut tree, and the paths are littered with dropping chestnuts in their porcupinish skins. That farmers do not care if hikers cross their land, and that there are no “keep off” signs, as so common in the US. That there are no people here to be seen, even in villages, and hardly any cars. This land is vast, luscious and sparsely populated. Today I really got a feel for the reason behind the ferocious defense of farmers’ subsidies by the French government. Theirs is a very special way of life and a way of relating to land. But of course these subsidies are not sustainable. We contemplate the alternatives. What if a new generation of farmers-entrepreneurs could build wind farms here, install photovoltaics and grow crops for biomass instead of food production? That might create a future for this beautiful land without destroying its special features. We also discover the most beautiful village yet: Montferrand. It is medieval and seems untouched by time. It is completely still, with no people on the streets. But there are signs of life here: through an open door I see an old woman cooking, behind a vine-covered wall I hear a loan mower and smell freshly cut grass, a house in the process of renovations, a restaurant with signs of recent use (perhaps on Sunday?). A run-down house with a ‘for sale’ sign catches Philip’s attention. Later he calls the phone number and finds out that it is two house plus 2 hectares of land, and the asking price is 300,000 Euros. The wrong property at a wrong price in a perfect location. So we walk and walk, for hours. The picnic lunch on the roadside is a pure bliss: the cumulus clods in the sky, the wild mint plant give off their aroma, it is all ours. We also discover in the process that we are out of shape for walking and unaccustomed to wearing hiking boots. By the time we get home at 4:30 we are human wrecks. Happy wrecks. We have dinner on the terrace. I am getting increasingly creative in making dishes from whatever we have around. Today we drive a lot. Philip has a business meeting with Jean Araillet, general manager of electric vehicles company in Ste Foy de Peyrolieres, a suburb of Toulouse. We leave the house at 8 AM. During the first three quarters of an hour on the back roads of Dordogne, before getting on the highway, we pass fewer than 50 cars. Around Toulouse we get off the highway, and slowly make through an endless succession of traffic-calming obstacles: roundabouts, road narrowings, speed bumps. It looks like in France traffic designers opt for technologic approach to speed control rather than the law enforcement approach used in the Netherlands and Massachusetts (speed postings and penalties for noncompliance). I like this approach much better because it is not adversarial. We arrive around 11:30. Jean Arraillet is a Lebanese Christian whose family emigrated to France. I like this man: he is articulate, direct but not overly open, conveys his message gradually but not opaquely. His wife Veronique is his business partner. We have a nice lunch in a nearby restaurant, hidden behind some hedges, certainly unknown to out of town visitors. We try out some of his electric vehicles. While Philip and Jean continue the conversation in the office, a large wall map of France catches my eye. Only now I fully realize how far south we have come. The Pyrenees and Spain must be no more than a hundred kilometers from here to the southwest, while Cannes, to the east, is on our latitude. By the time we say the goodbyes it is after 3 PM. Although late, we nonetheless try to make it to Albi, to the Museum of Toulouse-Lautrec. After having read Toulouse-Lautrec’s biography a few years ago I always wanted to visit this museum, the home of the majority of the collection. It is a mad drive, made so much so because we do not know the geography of the city. By sheer luck we not only find the museum but also a parking space in a narrow alley nearby. We are at the box office at 5:15, getting a surprised look from the clerk. The museum closes at 6 PM. It turns out that all we need is 45 minutes to get to know this painter. He is a brilliant observer, caricaturist and technician, but he is not reflective or introspective. His are not the type of paintings that invite long contemplation. On the street again we see a very different city from those we have visited so far. Albi is southern, both in architecture and in the light. The sun is very strong, despite the late hour. We walk around for an hour or so, buy some pastries for the road, then start off on the long trip home. We get home around 9:30, tired, having driven about 600 km today. We sleep late and take it easy today. It is a brilliant sunny day, perfect for reading on the terrace. This is how the first half of the day goes by. In the afternoon we go to the nearby river to check out the canoe rental place. It is open and offers one way trips at certain hours of the day. That will be for tomorrow. We linger on the river’s edge, reflecting on Sidharta and the symbolism of a river in Buddhism. Like time, it seems to move linearly, unstoppably and irreversibly, but if you look deeper you find that it cycles in nature and always renews itself, into eternity. We go to the Beaumont’s food market. On the way we discover another amazing village, Saint-Avit-Senieur, with a huge and beautiful gothic church and monastery, really a fortress. As everywhere here, the front door is open, and we are the only visitors. The faded frescos on the walls must be a thousand years old. We already know our way through the supermarket in Beaumont, and the friendly manager comes up to me to say hello. At moments like this I wish so much that I could speak this pretty language. The woman at the fish counter recommends to us a pale looking filet which later turns out to be indeed very tasty. Food here is of high quality and surprisingly inexpensive. We scan the cash receipt just to get a feel for it: a small bag of mushrooms costs somewhere around 30 Eurocent! I also buy a sort of tripe jelly mold, something called in Poland “zimne nozki” which means “cold feet” and is made of pigs’ feet. This is made of tripe. Philip cannot even look at it, he is so repelled. We stop at a café in Beaumont for a beer, then head home. After dinner, in the descending darkness, we take a long walk along the country road leading from the house. In the darkness, connected to our surroundings mostly through sounds and smells, I become mentally transported to the Polish countryside. I understand now why this area speaks to me so much. It feels like the countryside of southern Poland: the villages, farms, meadows and woods, the livestock, the endless country roads. It is all immensely familiar. And so is the sense of openness and freedom to go on and on, without cars, without signs for private property. The night sky is full of stars and the moon is bright. I sleep late again. Wake up to a pleasant day. Breakfast on the terrace, then a hike in the area. We find another village we have not seen before. We find walnut trees, laden with fruit, and take home a handful of walnuts littering the road. We pass a brand new house under construction, using both new materials and the local yellow stones that look old. Our hypothesis about the economy of this region is this: government subsidies keep the farmers afloat and the rest of the people live of tourism and foreign capital flowing into the real estate: house renovations and constructions for the Dutch, English, who knows who else, expatriates. According to our hosts, prices of the real estate are several-fold higher than a decade ago, although not very high by Dutch standards. In the afternoon we rent a canoe. A woman picks us up at the river-side café and drives us 8 km up the river, then over the next hour and a quarter we canoe back. The river resembles Charles River in Boston but is much faster. And of course there are no sounds of traffic or any other activity. Just silence. We meet many swans, in pairs or in groups, and pass old men with fishing rods. Whenever we encounter men here, middle aged or old, they are engaged in animated conversations. They seem to talk to one another much more than the American men. There is still enough of the sunny afternoon left to read on the terrace and get some suntan. We have dinner of veal stew on the terrace. The night is cold and starry. This is our last day here. And the warmest and sunniest of all. We read on the terrace until mid afternoon, eagerly soaking up the sun. Then we drive to the castle of …, famous for its splendid gardens. The reality is not as exceptional as that, at least not for us, the seasoned travelers. What we get is a pleasant walk through sculptured woods and a 360 degree view of the valley of Dordogne and the surrounding hills, with villages and chateaus. Worth the visit. From here we drive for about 45 minutes to Philip’s Dutch friends, Trudy and Pieter, who settled in France two decades earlier. They live in a deep countryside in a farmhouse they built themselves, on a large property, with chickens and who knows what other livestock. Pieter is a human ruin, due to a stroke seven years ago. The right side of his body, especially the arm and the leg are deeply affected. What is most striking, however, is his silence. His speech is perfectly clear but he says hardly anything. It is hard to know if it is a cognitive problem or psychological problem. I get a feeling that he inhabits a different world. Trudy is all life, warmth, engagement. I like her instantly, it seems with reciprocity. Others join us at the table on the terrace: their 17 year old daughter C…, a Dutch woman visitor, and a local French woman from the village (no English). Trudy serves a mushroom quiche, which would be excellent if served warm, and other simple things. We sit, sip wine and talk. This place must have been splendid before Pieter’s stroke: sheep, cows, visitors coming and going, a rural life. Today it shows a lot of neglect. Trudy eats compulsively through the evening. She finishes everything from every serving dish. This is not an easy life for her. Pieter is mostly silent through the evening, but his gaze is incredibly intent. To my surprise, C…, born in France, states that she feels Dutch. At the end of the long conversation I still do not understand why she does not feel French. An American-born child of Dutch (or otherwise European) parents would almost certainly say that they feel American. Something about the French culture? Or her upbringing? Hard to tell. As we are saying goodbyes, Pieter kisses me ardently on the lips. It feels like he is saying that it was a good evening, that he enjoyed the conversation, that he was with us after all. We stayed too long. We came for an hour and stayed four. It is about 10 o’clock and we have a long drive home. Philip takes back roads to shorten the driving distance, but they turn out to take us on an endless succession of hairpin turns on steep hillsides, through dense fog, dense woods, and mind-boggling intersection with barely visible directional signs for some remote villages that dot this countryside. Philip’s sense of direction is a miracle. I am completely clueless about our location. It takes us an hour and half to get home. This country is so large! We both realize that having a house here requires living here, getting to know the places, becoming part of it. This is not Wellfleet, where weekend visits work out so easily. And this is definitely a car-dependent country, which for me is a downer. Paris is 500 kilometers away from here. It takes us an hour and half just to get on a highway. After that, we just keep driving. I take the wheel for two hours, and Philip does the rest. We take two short stops and press on north. Monotonous landscape. We reach Paris in good time, after about 6 hours. I feel tired. All these signs of not having as much resilience as I used to have! We have no map of Paris. Philip is confident of his knowledge of the city. This confidence gets us into a bit of trouble: we end up going in circles for an hour, getting stuck in the middle of intersections after the lights turned red, with buses aggressively stopping about one inch from my face. I get quite anxious and restless. When we finally find the hotel on Rue Stanislas, off of Boulvard de Mouparnasse, it turns out to be nice, cozy, and very quiet. Philip parks the car in a nearby underground garage while I check us in. The elevator is the smallest I have ever seen: two persons can barely fit into it. The room is small, comfortable, with tired rugs and wallpaper. Our night on the town is not very long. We are really tired. A drink at a café, a dinner at a good Indian restaurant in the neighborhood, tea at another café. We get to the hotel around 10 completely wiped out, and fall asleep almost instantly. We sleep for an unbelievable 11 hours. A cloudy day, cool and pleasant for walking. We walk and walk. The familiar boulevards, the gorgeous city. Short breaks at cafes. We watch street performers by Center de Pompidou and admire the architecture of Les Halles. We delve into the narrow streets of Marais. They are familiar to me, after having spent a week here eight years ago with Jerry, and then staying with Sylvie and John on my way to and from China. Since my last visit, Marais has changed. It is all very chic and fashionable. Reminds me of SoHo in New York. The guidebooks still describe it as a place where orthodox Jews and gay men mingle, but I do not think that Jews live here any more. The kind of kosher shops I saw here seven-eight years ago — a bit shabby, a bit disordered, clearly serving the locals – are no more. Today’s kosher shops serve the Parisians from other parts of the city. There are also other middle eastern shops. We also pass a Jewish bookstore. I give money to a beggar woman at its front door. Pricey boutiques with retro-type stylish fashions dominate this area. Today is the erev of Yom Kippur. There are long lines at Jewish bakeries. People are getting challas and Polish-looking pastries for tomorrow’s fast-breaking. I am drawn to my tribe: I scrutinize the faces of the shoppers, looking for Semitic features and orthodox clothes. I find very little of either. These are just Parisians. We stumble upon the Museum of the City of Paris, and we go in, partly to get out of the rain. It is a beautiful mansion with a pleasant garden. Inside, we focus on the history of the French Revolution. We both have gaps in the knowledge of that period, especially how the Revolution turned into the reign of Napoleon. On the way out we rest for a bit in the garden. The rain is over, it is now a lovely Sunday afternoon of early fall. While we were in the museum, huge crowd of Parisians turned out for a stroll in Marais. The streets and cafes are full of stylish people of all ages, out on the town. The clothing shops have opened up. The last time I have seen women so serious about shopping was years ago in Filene’s Basement. Judging by the crowds in the shops and the intensity of the shoppers one could think that these clothes are given away for free! It is after four and we are tired. We have an excellent large, slow meal. Unlike the small town of Dordogne, in the cosmopolitan Paris you can eat and drink whenever you want. For the first time during this trip I am not out of phase with the rhythm of a day or the food police. After the meal we stroll some more, I visit a few shops (not my kind of stuff), finally take a metro home. We lie down before the evening. Philip sleeps while I read. At night we stroll and enjoy the cafes. Watch people. The street lights in Paris are often attached to the buildings, which brings out the architectural details of the buildings in the most amazing ways. At night it is a different city. Today we shop, though not very successfully. The boutique I have been eyeing on Boulevard de Mountparnass never opens. It is one of these little shops – its name is Mary and Edith – that is probably run by two women who work three or four days a week, or whenever. I desire the beautiful items in their window display, and am prepared to pay their significant prices. We go to the Salamander shop on boulevard St. Michelle, which we spotted yesterday, and I buy two pairs of shoes. Very reasonable prices. I remember this shop from the very first time I visited Paris, about 20 years ago. I remember looking at its display then, and considering it too expensive for me. This is amazing: that I still remember it, and that the prices seem so accessible to me now. The rest of our shopping yields nothing. The fact is that we do not know where to shop in Paris. Champ d’Elize is very disappointing: just ordinary things I can buy in America. Next time I will investigate the shopping scene in Paris. I write down the address of Mary and Edith’s little boutique (#120). By 2 PM it is time to go. Another café, another look at our neighborhood, and we set off for the drive home. After stopping for dinner in some small town in Belgium (very rich, not so great), we arrive in Voorschoten before 10 PM.